Eye Care Tip of the Week offered up by our team of Stonewire optometrists every Tuesday morning, directly to your inbox. Patients call our office around this time of year, looking for cheap non-prescription Halloween or special effect contact lenses to finish out their custom. Stonewire, however, does not sell Halloween or special effect contact lenses to the public because we have not yet found a brand that we feel is safe to wear. Many of these novelty contact lenses offer reduced oxygen transmissibility, which can lead to hypoxia-related complications to the cornea and may increase the risk of developing an infectious keratitis. 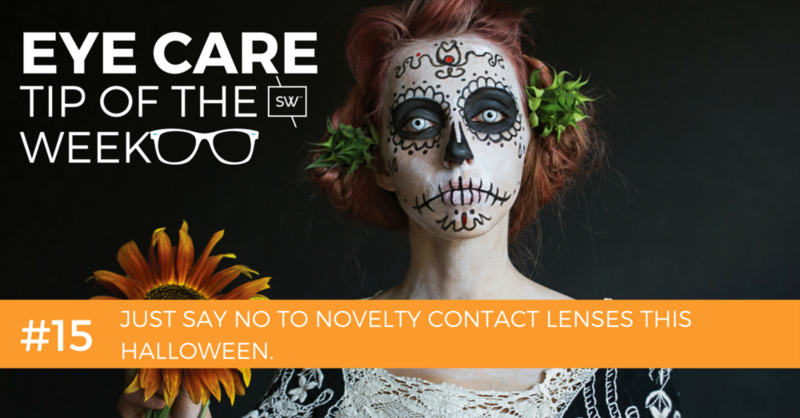 To learn more about the risks, check out this excellent blog post written by one of our optometrists: 'Scary Halloween Contact Lenses' or feel free to check out the section by the FDA on Decorative Contact Lenses. You can also talk to one of our optometrists about alternative options. See your eye doctor within 24-48 hours of seeing flashes or floaters. Seeing flashes or new floaters in your vision is a common emergency that patients present to our clinic with. The problem though is that most people wait too long before seeing us, hoping their symptoms will disappear. Our primary concern is ruling out a retinal detachment which is a potentially serious sight threatening condition. Delaying seeing a doctor when you notice these vision changes may result in a delayed diagnosis, treatment and a worse potential outcome. If you ever see flashes of light in your eyes or new floaters, you should be examined by an optometrist within 24-48 hours. If you experience a corresponding reduction in your vision, we should see you right away. Emergency visits such as these are covered under Alberta Health Care.